then bam -- 91 today. Today was my second fastest Promise Land. It's really 33.4 miles, NOT 50K! And it's very hilly. It ain't your grandma's 50K. finish line tape when a woman came out of nowhere and passed us both. The crowd went wild. That's the second time that's happened to me at that race. I feel pretty good. No running tomorrow, but maybe Monday . . . "
The hottest-in-race-history PL 50K++ more closely resembled Hades than the Promised Land this year, about 20 degrees hotter than the valleys of the Blue Ridge Mountains in Virginia should be in late April. But 247 (90%) of the 273 ultra runners who began the race finished it in ten hours or less to win the nice Patagonia finishers' shorts. Another ten made the last course cut-off, came in after ten hours, and were awarded an official finish (but no shorts). That's an amazing finish rate for 1) this weather and 2) a David Horton race! Too bad the other races in his series with Clark Zealand don't have such generous cut-offs. As Jim mentioned in his letter above, this isn't your granny's 50K. Not only is the distance measured in "Horton miles," the terrain is also challenging. 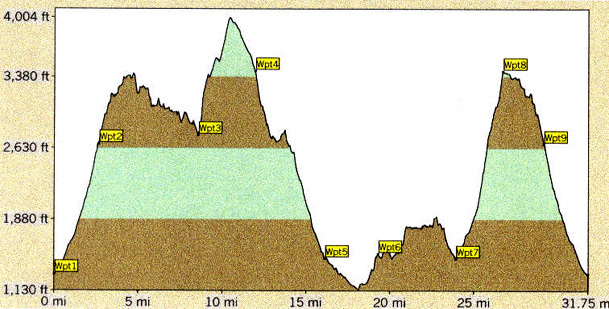 Yes, there are a lot of dirt and grass "road" miles but there are also rocks, roots, streams to cross, steep steps to climb in the latter part of the race, and lots of elevation gain and loss: over 15,000 feet total in 33+ miles. 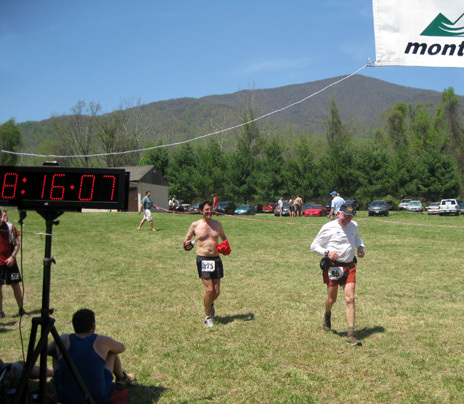 Jim tied with Rob Apple (shown below) for 160th of the 257 official finishers. He was 2nd of eight in the M60-69 age group. Only one man and one woman older than Jim were ahead of him -- the rest were all younger. So were the majority of the runners who came in after him. Good job, Jim!!! Or as he joked to his son in his e-mail, "You're the man, Jim!" Since our Virginia house is only a bit over an hour from the Sunset Fields overlook on the Blue Ridge Parkway, Jim and I like to train on parts of the Promise Land course before this race. Sunset Fields is one of the major aid stations during the race, serving the runners at approximately 12 and 27 miles. 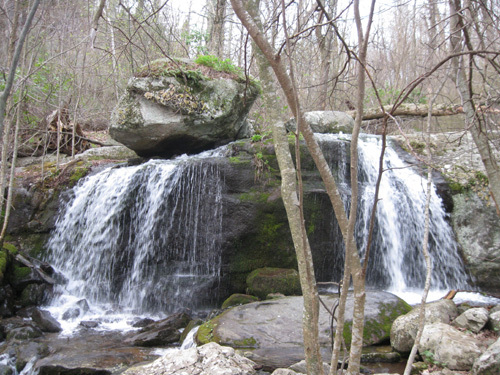 It is also the best location for Jim and me to reach the Glenwood Horse Trail, Apple Orchard Falls Trail, and Cornelius Creek Trail for training runs. 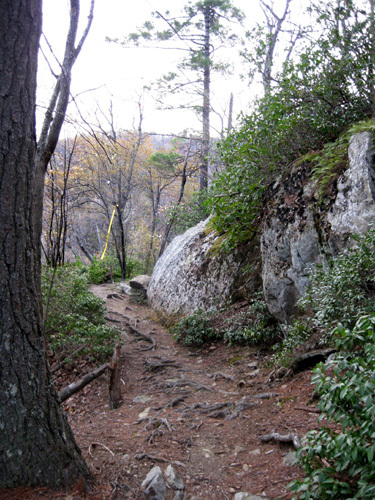 It gives us a variety of terrain and distance options on these and other trails (e.g., the Appalachian Trail). When Jim was developing a plan for his 2009 races he was looking for events that could serve as a buildup for the two summer 100-milers he wants to run, Bighorn in June and Tahoe Rim Trail in July. Ghost Town 38+, Rocky 50-miler, Mississippi 50-miler (which ended up being a 50K for him), and the Umstead 50-miler all entered into that plan. But he needed a couple more races of 50 miles or longer in April and May, preferably ones with more mountainous terrain and/or higher elevation to better train for BH and TRT. He searched and searched the race calendars on the internet but couldn't come up with a race that long and tough in the East during the spring. Then he had an ah-ha moment: why not do a Double Promise Land?? We don't know anyone who's done the PL course twice within 20 hours (for good reason!). I thought Jim was kidding at first, then realized he was serious when he started telling me about his plan. If he could pull it off it'd be great training for Bighorn, missing only the element of high altitude. His idea was to run/walk the entire course in a little under ten hours (the race's official time limit) on Friday night, take a few minutes to eat and rest, then run the official race on Saturday. I'd drop him off at the Promise Land Youth Camp on Friday evening. He'd tell RD David Horton about his plan, then begin running at 7:30 PM. I'd crew him twice at Sunset Fields and twice at Cornelius Creek during the night, then meet him at the race start on Saturday morning. After taking a nap, I'd crew him once or twice more at Sunset Fields during the "real" race -- and drive his tired body home Saturday afternoon! Running 100K on the Promise Land course would be more fun if he had an accomplice, of course. That wouldn't be a problem during the race; he'd have lots of company then. But overnight all by himself? He had a great idea for that, too: why not see if his Roanoke buddy Steve Bowles would be interested in doing the double, too? Steve's and Jim's times in the race are usually pretty close, and Steve was already entered. Lo and behold, Steve was game. Anything seems possible in January or February, right? Jim and I were still on the road at the time, so the guys had to wait to begin training together on the course until after we got back to Virginia and after Jim recovered a bit from Umstead. They ended up doing three training runs together on the PL course in April: about 25 miles on the horse trail loop and the entire big loop on the western side of the course (Cornelius Trail, Collin Hollow Trail, a couple dirt forest service roads, and Apple Orchard Falls Trail), 16+ miles on the horse trail and upper part of the large Apple Orchard Falls loop, and 8+ miles on just the large falls loop. When Jim came home from his first long training run on the course with Steve he announced that they were giving up any thoughts of doing the double! Even though Jim is better trained than he's been for several years, he was tired enough from Umstead only one week earlier that he realized a double PL might be unattainable. In addition, Steve took a hard fall and hurt his already-chronically hurting back. It was a mutual decision that they'd be better off doing just the official race and not trashing themselves during the night before it. In hindsight, this would have been a bad year for anyone to do a double Promise Land. Everyone knew ahead of time that unseasonably hot weather would add to the challenges of the course. 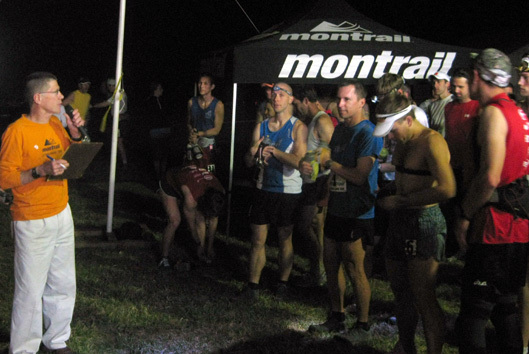 Friday night was great for all the runners who camped out in the PL youth camp field at the start/finish -- warm and clear -- but it would have seemed hot and muggy to anyone running/walking up and down the nearby mountains all night. It was still dark when the race began at 5:30 AM but quickly warmed up as the sun rose above the ridges. We arrived at the youth camp about 45 minutes before the race began. Although there is a large field to accommodate dozens of vehicles, small RVs, and tents, our camper would have taken up too much space and been too much hassle to take for only one night. So we just got up at oh-dark-thirty and drove from home. Rob Apple (R) signs in with RD David Horton (far L) and Charlie Hesse. 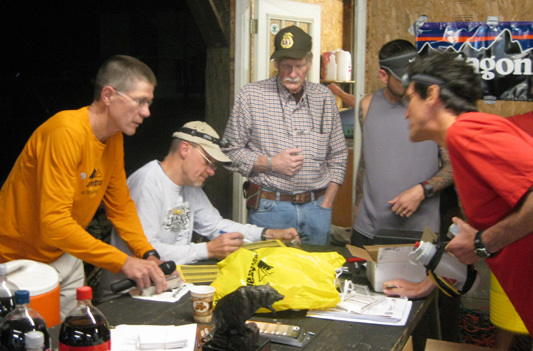 After Jim signed in at the youth camp shelter we mingled with friends until the race began. You can see more pictures of them and the race course on our Picasa photo-sharing site. I waited until the sun came up to drive narrow, hilly dirt Wheat's Valley Road and paved US 43 up to the Blue Ridge Parkway so I could park at Sunset Fields. My goal during the race was to get in my own training run on two parts of the course and to see Jim when he came to the aid station the first time. The sun had already risen to the east. 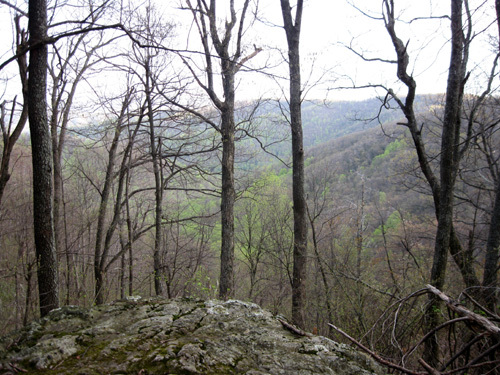 The view above looks west toward the valley where the runners would head on their 14-mile long Cornelius Creek/Apple Orchard Falls loop. Sunset Fields would be a busy spot in another hour, after the aid station was set up and the first runners were coming through, but at 6:20 AM I pretty much had the place to myself in the soft morning light. I decided to go down Apple Orchard Falls Trail before any of the runners reached it, see Jim, then run some more miles on the other side of the parkway on the Glenwood Horse Trail. By then all the runners would have passed that trail and I wouldn't be in anyone's way. to begin a large clockwise loop down into the valley on the west side of the Blue Ridge Parkway. They come back UP Apple Orchard Falls, but they do not go all the way DOWN it. I noted that there were ribbons both left and ahead (where the runners would be coming back up the trail later in the race) but there were no signs directing runners to the left as they descended the trail. That looked to be a problem but I decided it wasn't my responsibility to direct the runners. Besides, what if Horton had changed the direction runners were to run the loop and I didn't know it? I figured either someone would be coming down to direct them correctly or the runners were expected to know the course. I enjoyed the journey down the rocky trail. 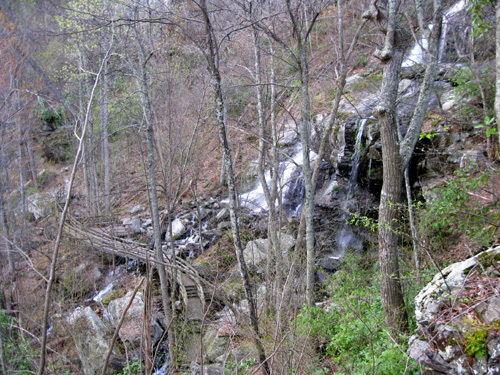 In addition to the main attraction there are numerous smaller and larger falls along exuberant Apple Orchard Creek both above and below Apple Orchard Falls. The trails on the course were all in good shape on race day although I'd describe them as "juicy" in some places because of all the rain our area received in March and April. They were certainly better than a couple years ago when there was considerable mud. The creeks were cold, clear, and running fast, providing much-needed pools for runners to cool off during and after the race. 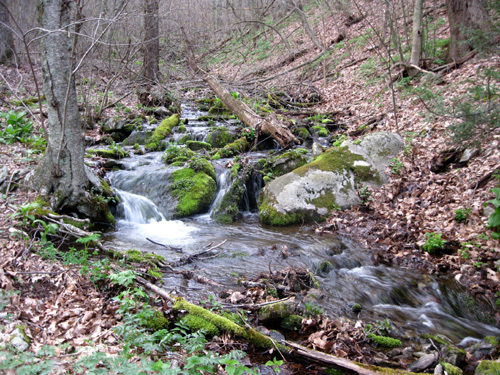 During a dry summer, the creek nearly dries up and the various falls are only a trickle. Today they were magnificent. 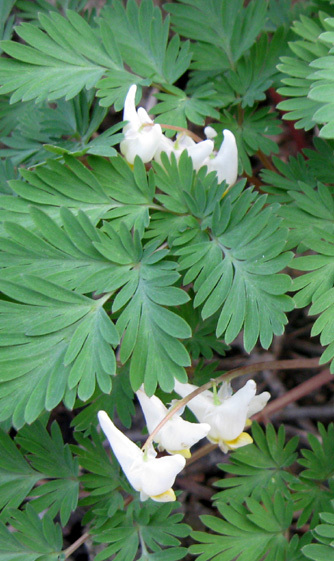 Although the leaves weren't out on the trees at Sunset Fields (elevation about 3,500 feet) I could see spring "creeping" up the mountains in the distance and noticed more and more green leaves, understory plants, and flowers the farther down I went. Above Apple Orchard Falls I encountered the notorious wooden steps that prevent the trails from eroding away from environmental factors and foot traffic. 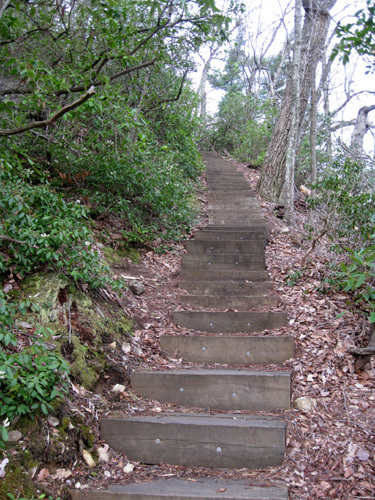 Runners come up those steps between miles 24 and 27 when they are already tired, in the middle of a 2,000+ foot gain in elevation. Since I hadn't already run all that way, they weren't a problem for me on this morning. Going down them was more of a problem with my Granny knees than going back up. Apple Orchard Falls were at a normal spring flow. 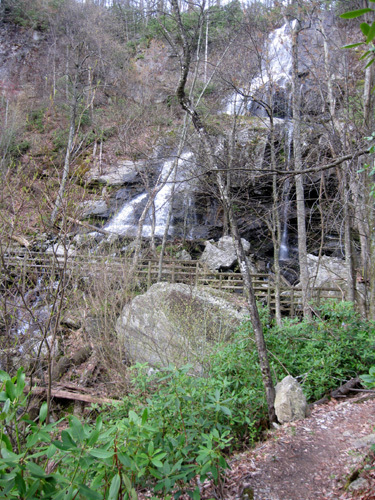 It's always hard for me to get the entire length of the 150-foot falls into one photo from the bottom and boulders hide part of it when viewed from the stairs. 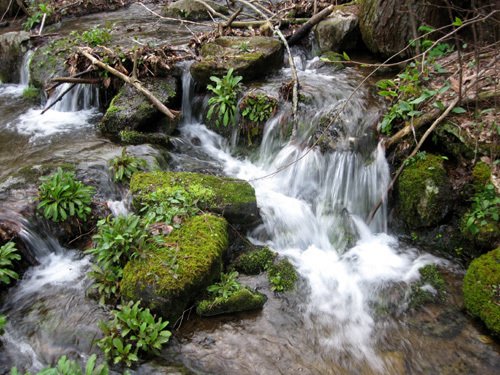 There are close-ups of the multiple cascades on our Picasa site. I turned around below the falls so I wouldn't have to negotiate some boulders. I wanted hill training, not rock climbing. At the top of the stairs I was nearly run over by young Jordan Whitlock, wearing bib #2. My fear was realized: someone apparently missed that unmarked left turn! I told Jordan he should probably turn around, run back up about half a mile to the old road, and go right (the correct direction from downhill). If the course was the same as it had been the last eight years and he'd kept going down, he either would have been DQ'd at the Cornenlius Creek AS or would have had to retrace about three miles of the course, not half a mile. When I got back up to the intersection with the old road it was manned by George, one of David Horton's trusted volunteers. Jordan beat him down to it and failed to notice where George verbally told him to turn. The next two runners, who would end up in the first two finishing positions, made the turn correctly and young Jordan was unable to catch them. He was leading the race up to that point (about 13 miles). He ended up third. He seemed to take the goof in stride, happy with his effort and a bit wiser about paying attention during races (he's run Promise Land once before). When I got back to the finish, he again thanked me for turning him around and saving his race. 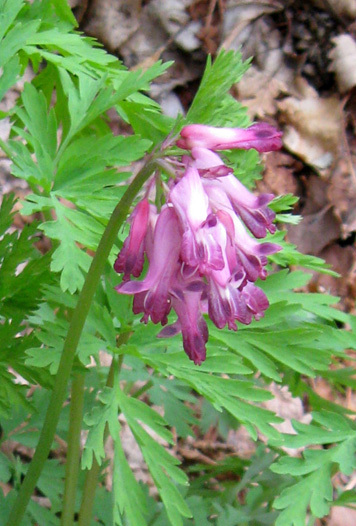 As I was coming back up Apple Orchard Falls Trail I met about thirty runners coming down and stepped out of their way. It was fun to encourage them and take photos of some of them (see Picasa). The main "bubble" of runners was still coming into the Sunset Fields aid station at 12 miles when I arrived back at the Parkway. I didn't have long to wait until Jim and some of our other friends arrived. Jim didn't need anything out of the car. He looked great and was on his intended pace. 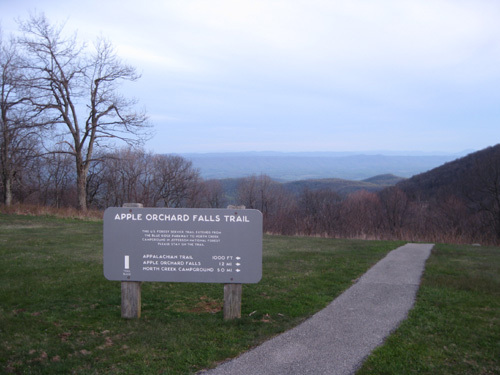 He got his bottle refilled with the race's energy drink, Conquest, grabbed some munchies from the aid station table, and was on his way down-and-up the 14-mile Cornelius Creek-Apple Orchard Falls loop. I wouldn't see Jim again until the end of the race. Runners return to the Sunset Fields aid station at about 27 miles but Jim would probably run the remaining miles, which are mostly downhill, faster than I could drive the circuitous loop crews must take to get back to the finish. 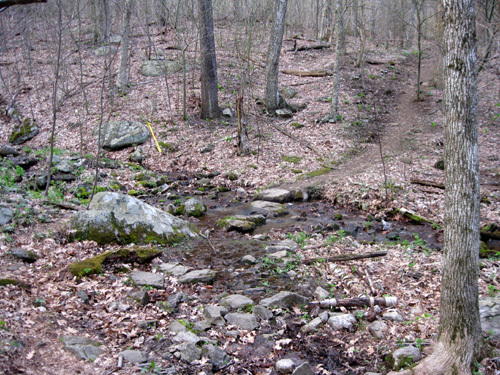 The much shorter route between the youth camp and the Blue Ridge Parkway, Overstreet Creek Road, is off limits to crews because a couple miles on the narrow road are used by the runners outbound and inbound. The road also becomes too rough for 2WD vehicles to negotiate after it enters national forest land. Trust us on that one! After Jim passed through the aid station I prepared for some more miles on the Glenwood Horse Trail. 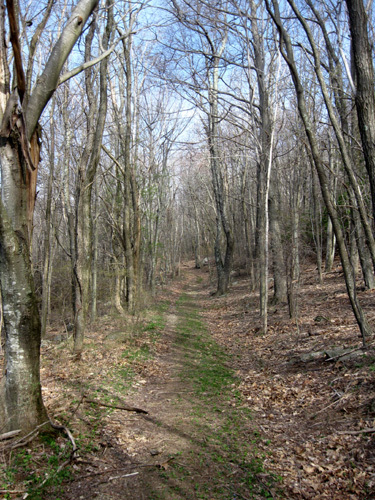 This trail stretches for many miles along the Parkway and is popular with both equestrians and local runners/hikers. 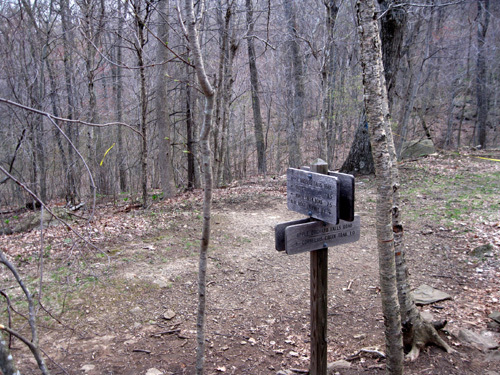 The Promise Land course makes a right off Overstreet Creek Road onto the horse trail at about 2� miles. 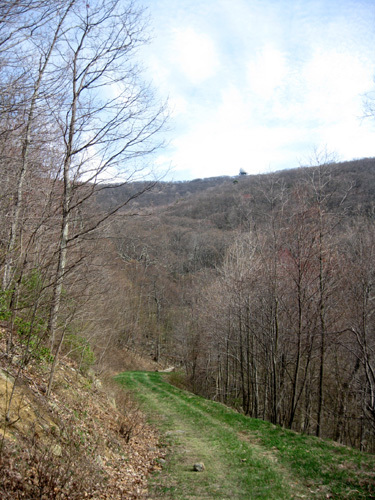 A couple miles of single track morph into a wide, grassy, rolling section of trail that goes all the way around Onion Mountain to Reed Creek before ascending another trail up to the Parkway near the 4,225-foot peak of Apple Orchard Mountain. Distinctive FAA radar on top of Apple Orchard Mtn. Jim and I love to train on this section but we discovered that it quickly becomes overgrown and nearly impassable in the summer when the grasses and flowers get knee- and waist-high! It's great in April, however. There weren't as many flowers as in the summer but I did spot some low-growing wild strawberries in the grass. I thought perhaps the front runners would be coming down the old road, below, that connects Sunset Fields with the horse trail near the end of the race but I got back up to the aid station before the first runner, Sean Andrish, came through. At that point I decided it would be best to drive back to the finish and see if Horton needed any help. Sean and four other runners beat me back there! They had about seven mostly downhill miles to run and I had over twenty miles of mountain roads to drive. 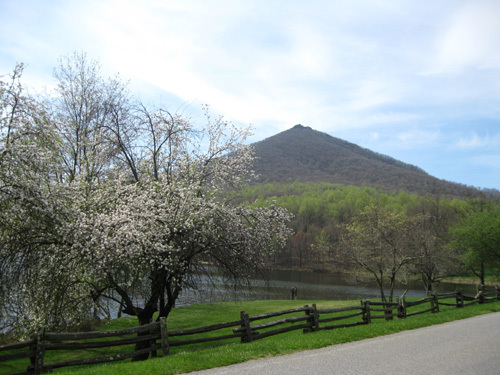 The drive may be slow, but it is very scenic along the parkway, past the Peaks of Otter (below), down the mountain, and through a valley filled with bucolic farms and orchards. Sixth-place finisher Keith Knipling was just coming into the youth camp entrance as I got out of my car about 11 AM. It already felt like 90� with the bright sunshine and always-present Virginia humidity. I felt sorry for Jim and the other runners who were still out on the course for several more hours. The heat would be a challenge for many of them. There are several nice rewards at the end of the Promise Land race: the satisfaction of finishing a tough 50K race, the nice Patagonia finishers' shorts, the grilled hamburgers and hot dogs and fixin's, and last but not least, the cold creek that runs behind the youth camp shelter. 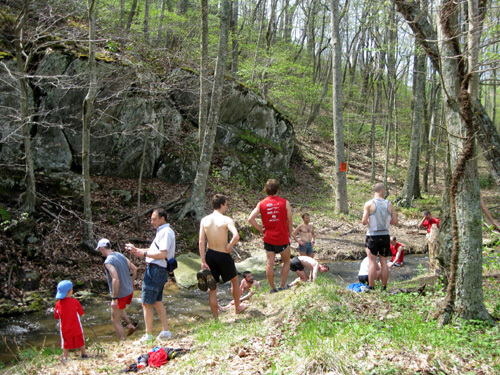 Many of the runners, including Jim, sat in the creek to cool down their hot bods. I was busy handing out shorts to other finishers when Jim wandered down to the creek but I took photos of some of the earliest finishers before David needed help with the shorts. 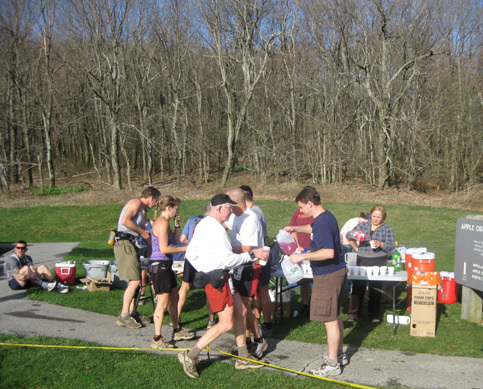 There are more pictures of the post-race creek scene on the Picasa site. David always calls out each runner's name as they come flying down the grassy hill to the finish banner. Then he gives them a big bear hug or enthusiastic hand shake and listens to their comments about the race. The first finishers are usually spaced far enough apart that he can pose for pictures with them, give them their shorts, and talk with them for a little while. He's good about remembering to give out the overall and age group awards, usually nice articles of clothing, as the runners come in. There is no official awards ceremony at this race, although he gathered the top ten men together for a picture under the banner. 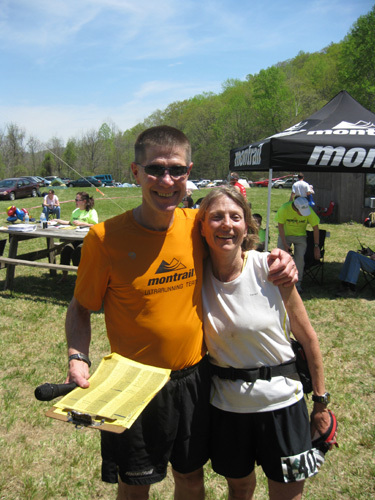 I'm also pleased that David recognized Barb Isom, shown below, for her fantastic F60+ age group win this time. 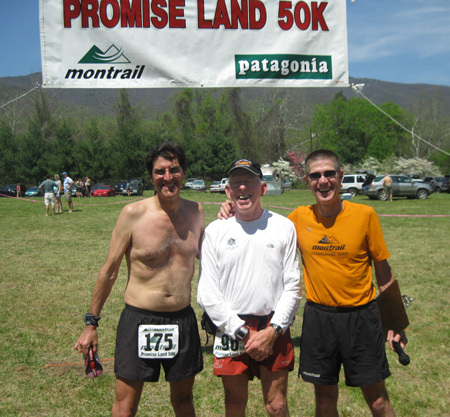 In the past he's refused at Mountain Masochist, Holiday Lake, Hellgate, and Promise Land to acknowledge the F60 group because there were few (or no) women finishers over 60. Some of us raised enough of a stink after Mountain Masochist last fall, when the first-EVER F60s finished the race and weren't recognized, that both Clark Zealand and David are apparently now recognizing these women's efforts. Barb even beat the first male 60+ runner by a significant margin at Promise Land!! I think that's just awesome. I'm glad she received some recognition for it AND the same age group award the first M60+ got. I think it will encourage other women over 60 to run this challenging race. And why didn't I run it? I turned 60 recently. It's because of the mountainous terrain and my cartilage-challenged knees. I think I could finish PL in the 10-hour time limit but I would have had to train more than I should on long and steep trails. Although I'm (foolishly) signed up for the Bighorn and Tahoe Rim Trail 50Ks this summer, I decided against running Promise Land and another rough, mountainous race Jim's doing in New Mexico next month (Jemez Mountain Trail Runs) despite the generous cutoffs in both 50Ks. Meanwhile, as David was getting swamped with runners coming into the finish line I began handing out the finisher shorts from Patagonia. That's always fun unless one or more sizes run out and the runners get miffed at me. This time they didn't run out and everyone seemed pretty happy with the styles and colors. 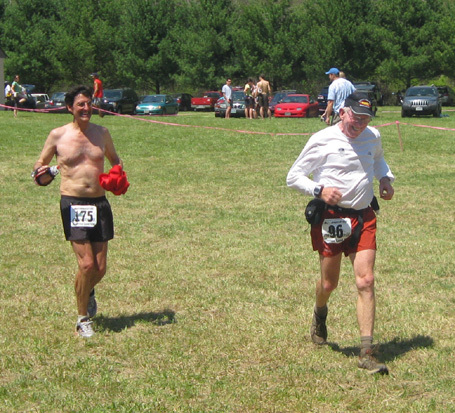 There were three colors of men's baggy shorts (black and two shades of khaki) and at least one color was left in each size at the end of the race. The women received pretty blue shorts. As mentioned, Jim's very pleased with his race (8:16:10) and soooo glad he didn't proceed with a double PL this year. So is Steve Bowles. When I saw Steve at Sunset Fields I though he might drop out, he was having so much back pain. But he hung in there for an 8:58 finish, which wouldn't have happened if he'd been out all night on the course. 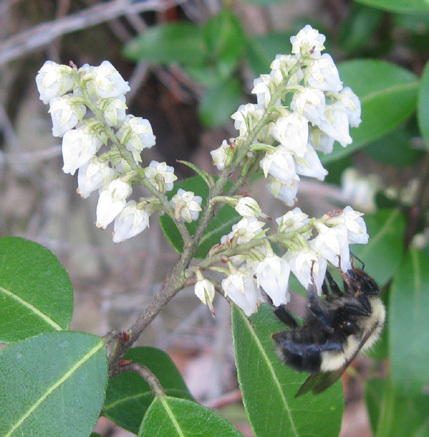 We're fast approaching the time to leave Virginia for our planned summer trip out West. Gas and diesel prices are much lower than last summer, even the past winter, and we've got a boatload (camper load?) of races planned to run and/or work. Stay tuned as I try to get this website caught up. I've got a lot more journal entries rattling around in my head than I've had time to put fingers to the keyboard.